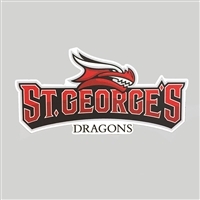 St. George's athletic dragon logo on a decal. Stick on bumpers, windows, laptops and more! Square static cling decal with school logo. 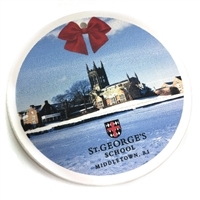 Measures 4"x3"
Square static cling decal with school logo. Measures 12"x1.5"
Stick on bumpers, windows, laptops and more! 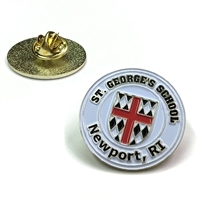 Measures 5.5"x3.5"
St. George's athletic dragon logo on a magnet. Keychain fob with SG athletic font. 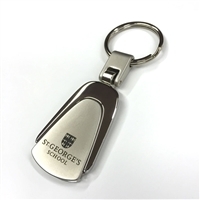 This key tag has the St. George's School Shield Logo laser engraved, and has a luxury look that endures for a lifetime. 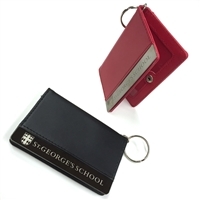 This leather ID holder features two transparent pockets for identification, two credit card slots, a button close and keyring attachment. Select your color before adding to the cart. This 3-7/8” stone ornament uses a lightweight blend of ceramic materials. Artwork designs are printed using permanent, fade resistant inks. Please note you'll need to supply your own favorite holiday ribbon to attach it to your Christmas tree. 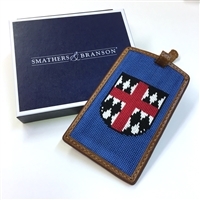 Custom made needlepoint key fob. SG Sailing Burgee by North Flags. 12" x 18"